Penguins... there are a lovely variety of meaningful gifts for anyone who loves penguins, from the opportunity to meet a penguin, feed penguins, or adopt a penguin. There are gifts to help penguins, gifts to meet penguins, and penguin gifts such as penguin pictures, penguin toys and penguin clothing. There are even penguin chocolates! With its signature black and white colouring and dramatic yellow markings, this lifelike stuffed penguin is ready for casual or formal fun! Quality construction and great attention to detail, make this penguin a durable and lovable pal. Befriend one or start your own penguin parade with two or more! For ages 3+. 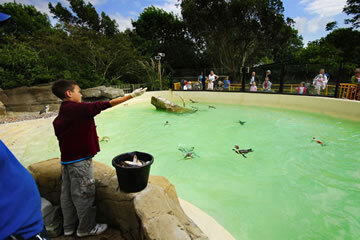 Would you like to have a Penguin Feeding Experience?